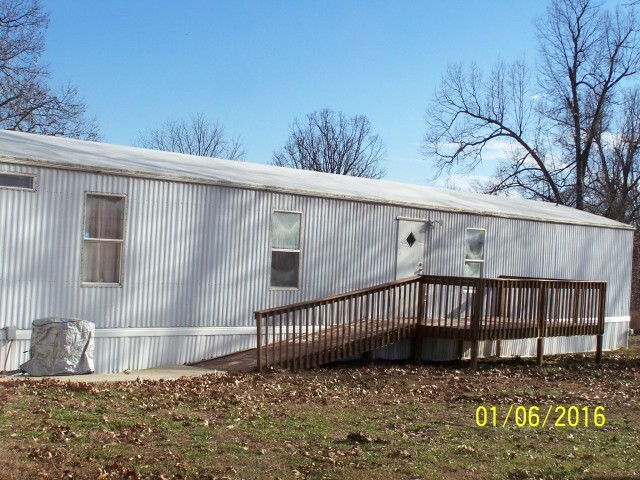 A well maintained 3 bedroom 2 bath mobile home with range and refrigerator is located on forty (40) of land. Land is mostly wooded. About 3 acres is cleared, fenced on 3 sides, and county road frontage. There is a well, septic system, a storm shelter, and an oversized 2-car garage/shop building. The mobile home is split style with master suite on one end, and two bedrooms and a full bath on the other end. The kitchen, dining area, and livinroom are in the center. There is a handi-cap ramp and deck at both the front and rear. Mobile home sits back out of view from the road. Must see, and you will fall in love with the land. Owner is anxious. Price has been reduced, and owner will look at offers.